The Volvo V90 is to be Volvo’s standard-bearing estate car, and its designer Thomas Ingenlath has said that Volvo aims to produce a car that improves the driver’s life – hinting that he feels its competitors have become too focused on becoming status symbols. Alongside the XC90 SUV and the V90’s saloon-bodied twin – the Volvo S90 – the luxurious new face of Volvo is now ready to be deployed. The question is; has the Scandinavian firm done enough to challenge the existing powers? We tested the new 2.0-litre 4-cylinder diesel engine dubbed ‘D4’, and it is a well thought-out unit because you really don’t need anything more than what it offers. 190PS, 0-62mph in 8.5 seconds, and a decent economy return of around 60mpg are exactly what most buyers will be looking for. It is quiet and smooth, as all good diesel engines should be, and it is expected to take up the majority of Volvo V90 sales. It perhaps isn’t quite as responsive as we’d like, but that is down to the relaxed nature of the automatic gearbox more than the engine. For those seeking extra poke, there’s the D5 ‘PowerPulse’ engine, complete with all-wheel drive, that shoots the new Volvo V90 to 62mph over one second quicker than the D4. Often enough, reviews of executive saloon and estate cars point out the sporty dynamics of the car being tested, and we can’t help but wonder why. Large estates and saloons are not there to be driven at full pace; first and foremost, they are cars that should be able to travel substantial distances in comfort. What we’re trying to say here is, don’t be put off by the Volvo V90’s front-wheel drive layout, it doesn’t need rear-wheel drive to feel great on the road. Volvo has chosen to make the V90 as relaxing to drive as possible, and it has stylishly succeeded in that aim. It is supremely comfortable and cushions anyone inside from the difficult road surfaces, but the suspension isn’t exactly spongy, so you still get feedback from the road surface and in the corners. If you’re familiar at all with the feel of German rivals, such as Audi or BMW, there are a few things you’ll notice almost immediately. The most prominent difference is the weight of steering. With Volvo aiming to make the driver’s life as easy as possible, the steering is far lighter in the Volvo V90 than in its German competitors, and the car is easier to manoeuvre as a result. 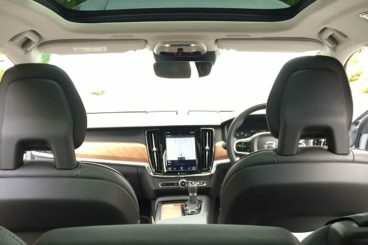 You’ll also notice the absence of triggers behind the steering wheel; this is because flappy-paddles are absolutely pointless for a relaxing luxury estate car, so well done to Volvo for doing away with those. In one of the most competitive sectors of the car world, the new Volvo V90 needed to start with a bang, and boy did it manage to do so. First impressions are crucial, but it makes a huge impact with a visually striking design; sleek and pure with dramatic light clusters on the rear end. Despite being a large car, it is low and appears streamlined, and the crisp finish to the edges and colour schemes gives it real presence. Volvo is on top form with its designs recently, and has perfected the recipe of eye-catching, yet classy, design. The fantastic Scandinavian design continues on the inside. It is light and airy, working very well in lighter tans and wood trims, and that makes it really stand out against the German black leather brigade. Volvo is keen to point out how the interior space is designed to celebrate light – something nearly all Swedish designers tend to do, as light is a precious commodity in the cold winters of Northern Europe. As with all Volvo’s, there’s a real focus on quality. The build, touchpoints, and feel of the controls all give the impression that they’ve been thought about and cared for – there’s nothing that isn’t done to a high standard. With Volvo pledging to end fatalities in its cars by the end of the decade, you would expect to see a wealth of safety technology deployed in the new Volvo V90, and there is. Volvo’s ‘City Safety’ package deploys sensors to keep an eye out for pedestrians, cyclists, and even large animals, and will operate the brakes if it deems a collision is imminent. Similar sensors and technology are used to prevent the car leaving the road too, and there’s a driver assistance system that works alongside adaptive cruise-control to provide a semi-autonomous driving experience. Safety is what Volvo is famous for, so the fact the car will even call the emergency services for you if you’ve been involved in an accident is no surprise. That service is part of Volvo’s ‘On Call’ assistance package. So often we criticise new cars for lacking a solid infotainment system, but the ‘Sensus’ system that Volvo utilises through an i-Pad sized screen in the centre of the dash is excellent, being user friendly and aesthetically pleasing. It takes a bit of getting used to, but once you do, you’re away with it. Unsurprisingly, the new Volvo V90 comes loaded with standard equipment, and thus represents better value as a base model over the German competitors like Audi and BMW. Kit such as adaptive LED lighting, comfortable heated leather seating, and dual-zone climate control all come as standard, as does full European satellite navigation. 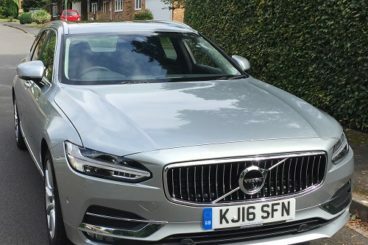 As an executive estate car, the Volvo V90 is by no means cheap, but it is very competitively priced in the segment it competes in, starting at £34,500. Of course, many buyers now get hold of their new car by using finance rather than purchasing the car outright, and there’s certainly deals to be had going about business in this way. Let’s not forget that Volvo often does customers very competitive deals, too. Search online and you’ll find some four-figure discounts being offered already, which is rather unusual for a brand new car. Right now on the leasing side of the business you can pick up a brand new entry level V90 D4 Momentum for £289 a month with six months down in advance, which is a very good price for such a luxurious vehicle. Meanwhile, over on the Volvo website, a £2,500 deposit contribution is being offered up to help lower your monthly payments. £6,000 from you will seal a new D4 Momentum for £369 a month on a personal contract purchase. If you want the Inscription trim, as tested, 12 months in advance will get you into one for just under £350 a month if you’re a business user. In a world of rather reserved saloon styling, it’s great to see Volvo’s team going for it. They haven’t held anything back, and have succeeded in producing quite a stunning estate car – by far the best looking on the market. It makes the BMW 5-series look old and tank-like, and it makes the Jaguar XF look like a 1990’s Vauxhall Vectra. 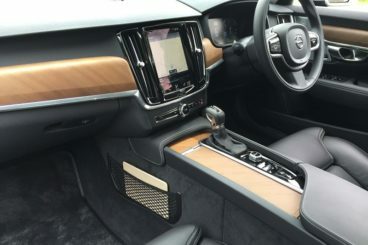 Almost all cars in this sector of the market are comfortable, but the Volvo V90 offers something a little bit extra with an assortment of small touches adding to an overall feeling of refinement. The soft-touch detail on the steering wheel, the ease of all controls, the fantastic leather seating, all of these things add up to make a significant impact. In a market saturated with German cars, a Swedish curveball might set a few more hearts racing than we might expect. It’s better looking than its rivals, and as we’ve discovered, it drives just as well too. Want to make the neighbours peek through the curtains? This might be the estate car to do it. Volvo believes that four-cylinder engines are the way forward, so no six-cylinder units are being offered with the new V90. This is a shame because although six-cylinder engines are more expensive and less economical, they usually offer a far greater sense of refinement. An opportunity missed? Designed to improve the ease of travel rather than offer startling pace, the automatic gearbox can be a little slow to relax, and isn’t quite up to speed with the automatic gearbox that BMW puts into their cars. That being said, it easily matches Audi’s DSG unit. Some people need that little bit of a performance edge, and the new Volvo V90 just doesn’t have it. This is about being relaxed behind the wheel, enjoying the drive, and feeling refreshed at the end of it. Those seeking a little bit of spice may need to look towards its rivals. 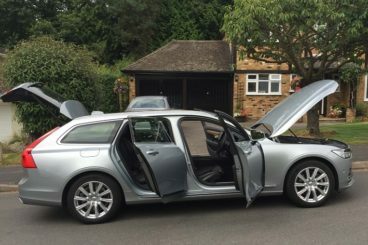 We love this Swedish car, but the good looking machine will have to demonstrate why it’s the executive estate to aim for. So, let’s compare the Volvo V90 with two major Teutonic rivals – the BMW 5-series Touring and the Audi A6 Avant. Putting these two cars side by side immediately shows up the BMW’s dated design. 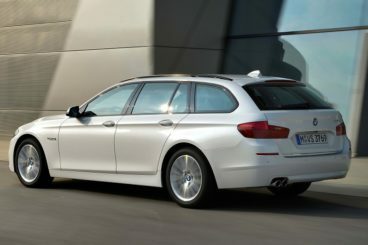 In M-Sport trim, the BMW also looks a tad too aggressive for a big estate car, though that trim level has proven ever popular over the years. Volvo’s sportier ‘R-Design’ trim is to arrive later on in the year, but until then, the more understated and considered Momentum and Inscription models are rather refreshing against the more belligerent styling packs that German models seem to push. 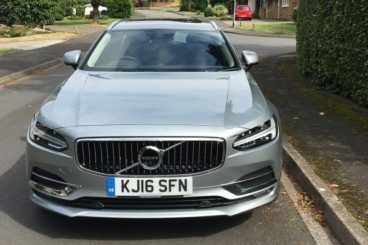 Of course, on the BMW, it isn’t just a sporty look the Volvo V90 has to contend with. The Bavarian estate comes with an assortment of engine options, but most buyers will opt for a smaller diesel like that found in the new Volvo V90, and if that’s the case, the cars have almost identical performance and economy. Basically, if you’re seeking more grunt or six-cylinder refinement, the BMW dealership might be your place to start looking. The BMW sits a little lower in the corners, hunkering down at speed, but the steering is slightly too heavy, and you notice that more having driven the new Volvo V90. Volvo has really hit the nail on the head when it comes to relaxing the driver, and the Swedish auto company makes a very good point without even having to say anything. It’s impossible to avoid talking about boot space with estate cars, but if you’re seeking as much space as possible, perhaps you need to look at getting a van. These cars are about as big as it gets, and the BMW 5-series Touring and Volvo V90 draw level at 560-litres each here. But, really, how can you need much more than that? Audi seems to be on a bit of a roll at the moment. It’s making some of the finest interiors in all of the car market, and is introducing new and exciting tech to bring its cars right up to date, with hot rivals such as Mercedes-Benz. While the Audi A6 Avant may not feel as special as an E-Class estate, it certainly has a very Audi driving characteristic to it, and that’s what brings a lot of buyers back. Audis are easy to wield, safe and sturdy feeling cars that inspire a lot of confidence in the driver and aren’t too tricky to get along with. This new Volvo V90, though, behaves in more or less exactly the same way; it’s just a little lighter and softer in feel. 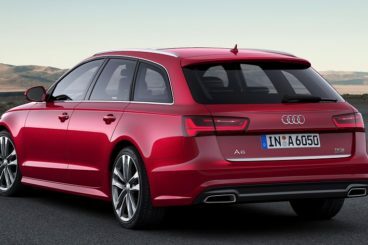 Once again, the lack of larger engines may prove a problem for some people, as the Audi A6 Avant does come with the option of bigger, meatier six-cylinder units. These lumps are smoother and more luxurious in feel, but more damaging to the environment and the wallets of owners. That being said, some people in the market for a luxury estate car won’t care too much, so Volvo may lose out on sales here. Which car from these two you prefer may come down to what kind of interior design you prefer. The Audi A6 Avant certainly has a bit more of a sporting feel about it, with aluminium touches and red flashes on the infotainment system – which isn’t quite as good as the BMW’s or the Volvo’s. It is darker inside, too, but some will prefer that – and they certainly won’t say no to a 565-litre boot space, beating the rivals here by a tiny five-litres. 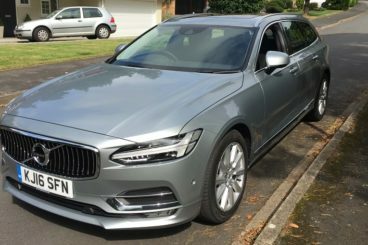 We can see a lot of buyers currently driving around in German estate cars being seduced by the new Volvo V90. It is an absolutely gorgeous machine to look at, and oozes quality from the design all the way to the drive. It stands out in the right way, it isn’t ostentatious or aggressive in styling, and that makes it feel even more special. A supremely comfortable ride isn’t quite as good as Mercedes-Benz’s optional air suspension system on the E-Class estate, but it’s just as good as the Audi A6 Avant’s, and beats the stiffer BMW 5-series Touring. We just can’t help but wonder if Volvo’s stubborn approach to environmental concerns may cost it sales when it comes to the absence of a more powerful unit. That being said, a T8 hybrid model is due to arrive next year, so we’ll keep you posted on how that drives. For now, why not change it up a bit? Try something different. The new Volvo V90 won’t disappoint buyers, and you can’t help but feel this might be the start of something special for Volvo.